The developing world lost US$859 billion in illicit outflows in 2010, an increase of 11% over 2009. The capital outflows stem from crime, corruption, tax evasion, and other illicit activity. The report finds that illicit financial flows. From 2001 to 2010, developing countries lost US$5.86 trillion to illicit outflows. This report has been cited by over 800 unique media articles in more than 110 countries. Global Financial Integrity updates the data from this report on an annual basis, at times making substantial methodological revisions. 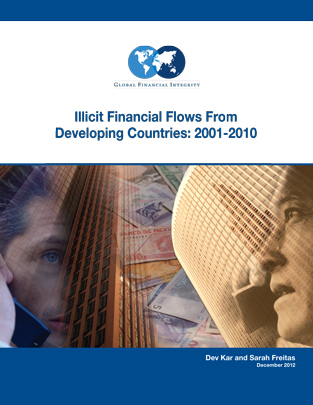 The most recent update is Illicit Financial Flows from Developing Countries, 2003-2012. GFI recommends citing from the most recently released research.